We had a phone call a few months back expressing interest in our Maori Haka War Dance team building activity. This is an energetic and fun activity and is becoming more and more popular. Surprisingly the phone call came from a bride soon to be married to her Kiwi partner. We don’t normally have many enquiries for weddings, so we were delighted to help out and be a part of their big day. The bride was arranging this in secret as a wedding gift to her partner due to his New Zealand roots (it must have been difficult to keep it a secret from him). So how it all worked on the big day… the bride made her speech and announced that she had a surprise gift for her partner, then there was a moment of silence as the suspense gradually grew before the roar of the call and banging of drums as the Hakas stormed into the room and performed their tribal war dance. They certainly made an entrance and shocked not only the partner but the rest of the wedding guests, as you can imagine this was not something that anyone would have predicted. The shock on her partners face was perfect as he had no clue what was going on. 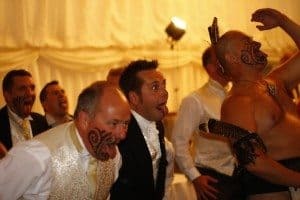 Once the Maoris had finished their performance they got the main members of the wedding party to get up and join in. After some decorative face painting, some chanting and a little practice they were then ready to perform to the rest of the wedding guests. This truly was an experience that none of the wedding guests will forget in a hurry especially the bride and groom. This just shows that Team Tactics can cater for any requirements even weddings! So make sure you consider us next time you are looking for a team building activity or simply corporate hospitality. Not Henley Festival or Regatta but HENLEY REWIND! !